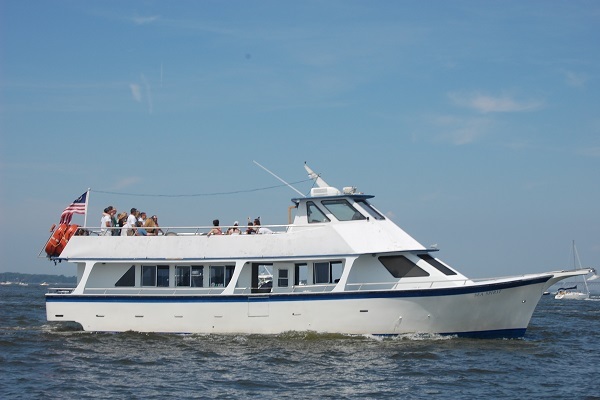 Our flagship vessel, The Sea Spirit is a 60′ custom built DMR yacht, certified by the U.S. Coast Guard to carry up to 85 passengers.When not on the waters of our majestic Chesapeake bay, she docks in Annapolis, Maryland. The Sea Spirit is a modern passenger vessel available to individuals and groups for private charters in addition to our public cruises. The enclosed main deck features a yacht-like interior with wall-to-wall carpeting, bar and comfortable seating. Its open-top deck, bow and sides offer tremendous vantage points for spectacular sightseeing. The Sea Spirit is perfect for birthdays, holiday parties, wedding rehearsal dinners, corporate functions or any private luxury event that you can imagine. Whether for a 2 hour event or an all day cruise, your voyage on The Sea Spirit is sure to create memories that you will carry with you far beyond your return to the dock. Planning an event? Contact Us or call (410) 353 4850 to inquire about availability.